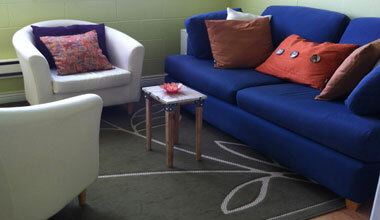 We have flexible counselling hours, with in person or online appointments available 7 days a week. We offer reasonable fees and flexible payment methods, with a strict confidentiality policy. Book an appointment online or call 604-629-7108. If you are unsure about how often you would like to come in, we recommend to begin with weekly appointments, but it is possible to come less frequently. It is not uncommon for a client to consult with a counsellor for one or two sessions, or engage in short-term work lasting 10-20 sessions. Clients who want to make more substantial gains in their personal growth, engage in longer term therapy. Our sessions are 50 minutes, 80 minutes or 110 minutes. Appointments are arranged by calling 604-629-7108 or by booking an appointment online. Please view our Session Options for more information on the different counselling methods we offer. Payment is due at the beginning of each session and can be made by cash, debit (Yaletown office only), Interac eTransfer, Visa, MasterCard, American Express, or Discover. After payment is received, a receipt will be issued by email. If you are seeing us in person, you may pay by cash, cheque or credit card at the time of your session. Please bring exact change if you are paying by cash. Prepayment is required for out of office clients. We accept payment through credit card, internet bank transfer or you can mail in a cheque. Prepayment is required before time of session. In Canada, if you are covered by extended health insurance at work you may be eligible for some coverage of counselling sessions. Before you come for counselling, call your insurance provider (e.g., Great West Life, Blue Cross) for your coverage details. Please view our Insurance Information Here for more information on insurance. Clients must provide a minimum of 48 hours notice for all cancellations. Appointments that are cancelled or missed without 48 hours notice will be charged the full amount of the scheduled appointment. Cancellations or changes to your appointment can be made by calling our office at (604) 629 – 7108. Snow policy or weather emergencies: Sessions are held at the appointed time by phone or Skype (instead of in person) in the case of a declared Snow Emergency (or other Travel-Ban).